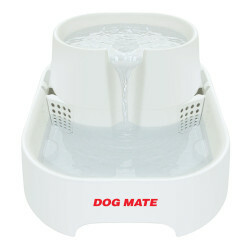 Dog Mate Ltd. is based near Heathrow Airport, London, England, and is one of the world's leading manufacturers of high quality, innovative pet accessories. Dog Mate provides quality products to pet owners in over 40 countries. Dog Mate believes that the best quality starts with the best design. This philosophy is combined with use of the best materials. All of this means that Dog Mate customers get maximum product quality. Dog Mate's dedication to research and development has resulted in high quality, long lasting products geared specifically for the dog in your life. Manufacturing is entirely controlled in house, with stringent standards so no item reaches you that hasn't been thoroughly tested and approved. 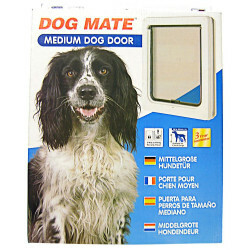 Dog Mate's Electromagnetic Dog Door is a revolutionary way to make sure only the animals you want inside get inside. Simply attach the non harmful magnet to your dog's collar, and he will be allowed to pass while wild animals and strays won't! As always, Dog Mate's focus is on making your life as a pet owner as easy as possible. Be sure to browse all of our Dog Mate Pet Products to make sure you find just the right product for your dog's needs. Pet Mountain is proud to offer you a wide selection of Dog Mate Pet Products, at the very best prices available anywhere! Take a look at all of our huge selection of great deals! Can't find something you're looking for? Let us know! We'd love to help. Be sure to check out our online coupons and discount shipping on all your favorite products.